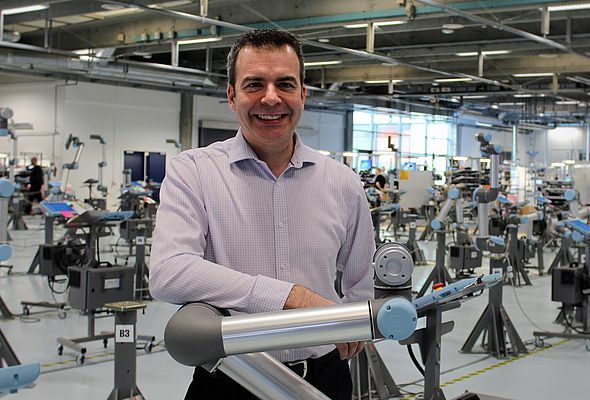 As the sale of collaborative robots gathers momentum in the UK and Ireland, Universal Robots has announced the appointment of Mark Gray to stimulate and manage this growth. He joins the company as Area Sales Manager with more than 25 years of engineering sales and marketing experience across diverse industrial sectors. Based in Doncaster, he is now directly responsible for the UR distributors that serve the home markets. UR is a world leader in cobot technology with around 12,000 robot arms installed worldwide. Their ability to provide fast, inexpensive and flexible solutions for all, including smaller companies, is now striking a chord with manufacturers in the UK and Ireland. Mark Gray initially qualified as an electrician and chose a career that took him from site engineering and project management to sales. He joins UR from Abtech, a manufacturer of vision systems, where he was Sales Director. The experience Mark has gained through 14 years’ service with Abtech is particularly relevant to his new role as it brought him into daily contact with OEMs, SMEs and systems integrators. He therefore has a clear understanding of how each can benefit from cobot technology.